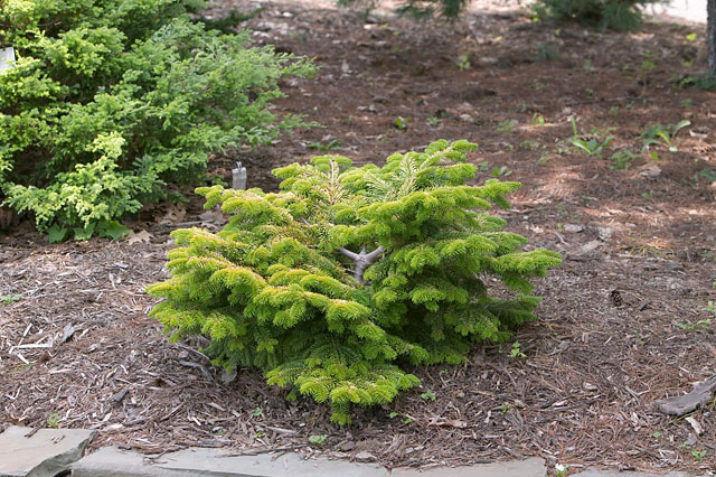 Abies nordmanniana 'Golden Spreader' is a bright gold selection of Nordmann fir. It grows much broader than high, and, when young, is somewhat depressed at its center. Since it does display a tendency to burn in the full sun, it should be grown in partial shade where it will still exhibit excellent color. As it ages, a slow-growing terminal shoot will develop, producing a mature specimen that is very dense, squat beehive-shaped, and very bright gold. After 10 years of growth, a mature specimen will measure 4.5 feet (1.5 m) tall and wide, an annual growth rate of around 6 inches (15 cm). This cultivar originated as a seedling around 1961 in the nursery of S.N. Shoots, Culemborg, The Netherlands, near Boskoop. Shortly thereafter, Konijn Nursery of Boskoop introduced it to the nursery trade. Because the tree will get somewhat large with age, it is better suited for a larger garden where the golden foliage will "light up" darker areas of the landscape. 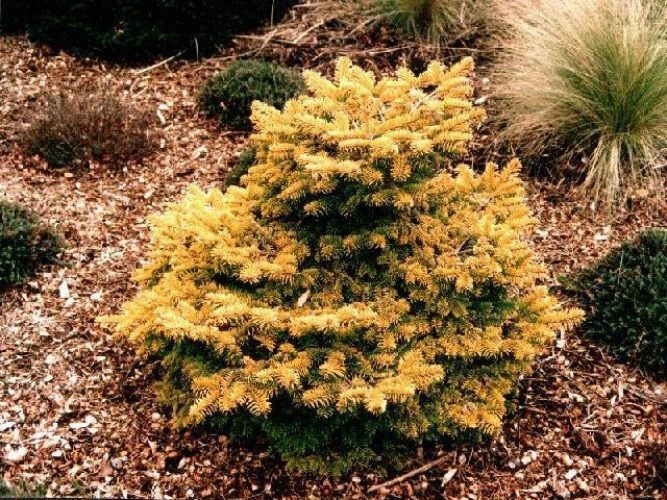 Abies nordmaniana 'Golden Spreader' — a 10-year-old plant in winter, Dorset, England. 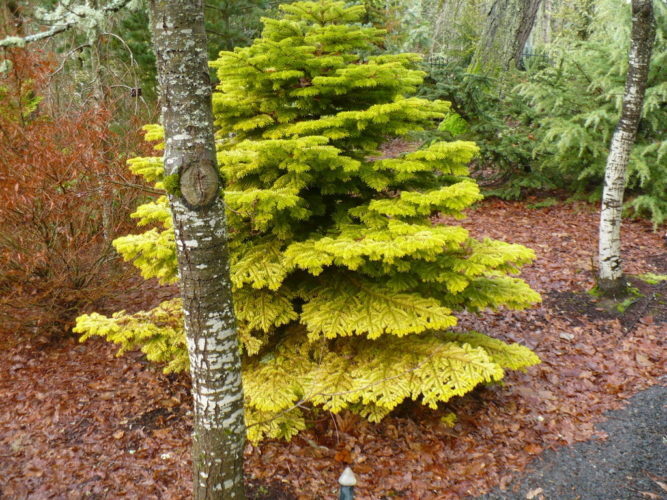 Abies nordmanniana 'Golden Spreader' — photo copyright of Green Industry Images. 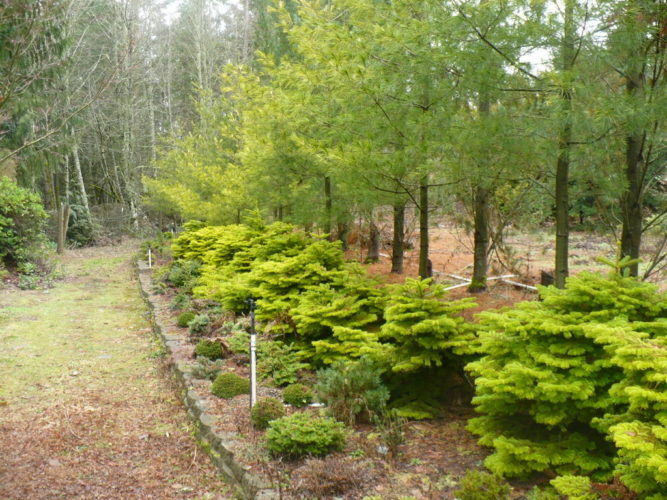 A row of Abies nordmanniana 'Golden Spreader' at Coenosium Gardens, Eatonville, Washington. Abies nordmanniana 'Golden Spreader' photographed at Coenosium Gardens in Eatonville, Washington.